Not all factories are huge, sprawling complexes, or generate vast amounts of traffic. This small factory receives one freight car each month, loaded with iron straps, which are turned into barrel hoops. Oak wood arrives daily by truck, and is shaped into the staves of the barrels. Several times a week, the factory ships out barrels by truck and train. Although most liquid products are now transported in tank cars or steel drums (or through pipelines), there is still some demand for wooden barrels in certain industries. 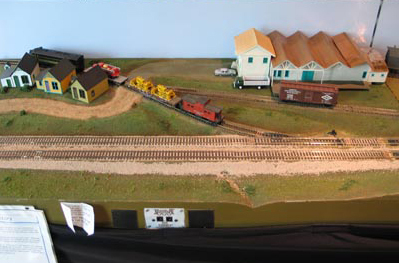 The configuration of this siding is called a "switchback" and requires the railroad crew to bring each car in and out of the siding one at a time. 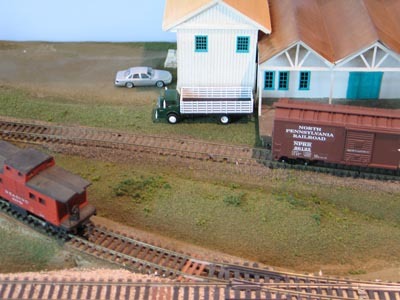 There just isn�t room for the locomotive and more than one car to run past the switch and back into the track along the loading platform, so they have to make several moves if there are two or three cars to be delivered or picked up. 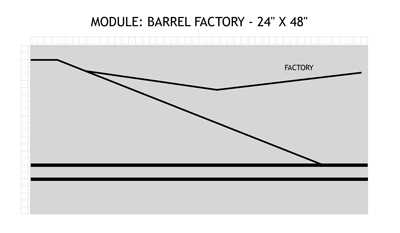 The barrel factory module, showing the switchback track. A close-up view of the module.